We would like to extend our deep gratitude to the following organizations for their kind support and assistance to several Hindustani Classical initiatives. The general term for musical instruments in India is Vadya. There are predominantly 5 types of them. There is a traditional system for the classification of instruments. This system is based upon; non- membranous percussion (ghan), membranous percussion (avanaddh), wind blown (sushir), plucked string (tat), bowed string (vitat). Here are the classes and representative instruments. The String Instruments are known as Tat Vadya. They are the Plucked Stringed Instruments. In ancient times virtually all instruments of this class were referred to as vina. Some of the instruments of this categorty are Sitar, Sarod, Saraswati Vina (South Indian Vina), Surbahar, Gotuvadyam, Rudra Vina,Vichitra Vina, Ektar, Tanpura, Dotar ,Santoor, Surmandal, Bulbul Tarang, Nakula Vina ,Magadi Vina ,Getchu Vadyam (Gettuvadyam) ,Gopichand (ektar), Seni Rabab, Been and Sarangi. The Blown Air Instruments. This class of instrument is characterized by the use of air to excite the various resonators. 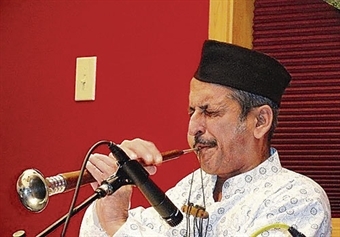 Some of the instruments of this category are Bansuri, Shehnai, Pungi, Harmonium, Shankh, Nadaswaram, Ottu and Surpeti. The Non- Membranous Percussive Instruments. This is one of the oldest classes of instruments in India. This class is based upon percussive instruments which do not have membranes, specifically those which have solid resonators. These may be either melodic instruments or instruments to keep tal. Kasht Tarang, Jal Tarang,Manjira, Ghatam, Murchang, Ghungharu ,Kartal and Chimpta. The Bowed Stringed Instruments. This is a class of stringed instruments which are bowed. This class appears to be quite old, yet these instruments did not occupy a place in classical music until the last few centuries. The entire class of instruments has a certain stigma attached to it. Even today only the Western violin is free of this stigma. Some of the instruments of this category are Sarangi ,Saringda, Violin ,Esraj, Dilriba, Chikara, Mayuri Vina and Pena. The Membranous Persussive Instruments. This is a class of instruments which have struck membranes. These typically comprise the drums. Some of the instruments of this category are Tabla, Pakhawaj, Mridangam, Tabla Tarang, Dholak Nagada, Dholki (Nal), Daf (Duf, Daphu, Daffali), Kanjira, Tavil, Khol (Mridang), Pung, Thanthi, Panai, Damaru, Chenda, Shuddha Madalam, Idakka and Udaku (Udakai).